Automakers have a lot riding on many of the global debuts at this year’s New York auto show. At General Motors, for instance, Cadillac is betting that its CT6 large sedan will help boost the brand back to luxury prominence, and Chevrolet is counting on a revamp of its Malibu to strengthen the midsize sedan’s sagging sales. At Toyota Motor Corp., Lexus aims for a redesign of its RX crossover to maintain the brand’s momentum, and Scion hopes the addition of its first two new vehicles in three years will help ignite enthusiasm for the brand. Some surprises also are in store, most notably a sports car variant from Porsche (the Boxster Spyder, perhaps?). The show’s press preview days are Wednesday, April 1, and Thursday, April 2. Cadillac will show the CT6 at an event Tuesday, March 31, in Brooklyn, hoping to jump-start show buzz with the sleek large sedan. Cadillac has said the mostly aluminum-bodied CT6 will be lighter than much smaller midsize luxury cars and packed with technology, including an in-floor sound system. The powertrain lineup will include a 3.0-liter twin-turbo V-6 engine, a 2.0-liter turbo and a new naturally aspirated 3.6-liter V-6. Chevrolet will show two key nameplates as it embarks on a broad overhaul of its car lineup: the Malibu sedan and Spark minicar. Chevy hopes to reignite interest in its light-selling midsize car with a lighter, more stylish Malibu and improved fuel economy. The Spark will be built on the same underpinnings as the just-unveiled Opel Karl minicar, which is lower and lighter than its predecessor and powered by GM’s new 1.0-liter, three-cylinder engine. Infiniti will show a substantially freshened QX50 for 2016, with reworked front and rear ends and a sportier design more in line with the recently unveiled Q60 coupe. Engineers have even lengthened the small crossover’s wheelbase by about 3 inches, addressing one of its chief drawbacks — cramped rear seating — and creating more interior room. The entry-level crossover has been a low-seller since it debuted in the 2008 model year as the EX35, and Infiniti has done little in recent years to counter speculation that the product might slowly disappear. The second-generation XF midsize sedan will debut. The 2016 XF will be built on Jaguar’s new aluminum-intensive architecture that will save 132 pounds on the rear-wheel-drive model and 265 on the all-wheel-drive version. It goes on sale this fall and will compete with the Mercedes-Benz E-class and BMW 5-series sedans. The XF has a coupelike body with improved interior room. It will launch with two supercharged V-6 engines, one with 340 hp and one with 380 hp. The sedan also will have Jaguar’s new infotainment system with a standard 10.2-inch touch screen. The redesigned 2016 Optima, slated to go on sale this summer, will be unveiled. Renderings released ahead of its debut suggest the midsize sedan will keep its fastback silhouette. Kia is expected to keep using the platform and engines from the current Optima, but retune them for a quieter, smoother ride and better handling. Lexus will unveil a redesigned RX cross-over — a giant in the segment, and one of only two luxury nameplates that regularly exceed 100,000 U.S. sales (the other is the BMW 3 series). In a typical year, the RX will make up a quarter of the brand’s sales. The redesigned 2016 RX, the fourth generation of the vehicle since its introduction 17 years ago, is larger and roomier than the current version and will feature a range of advanced safety features. It shares some components with the Toyota Highlander. Lincoln will announce the return of the Continental when it unveils a plush, high-tech concept version of the sedan that will replace the full-size MKS next year. Retro in name only, the 2016 Continental Concept features a new 3.0-liter EcoBoost engine that will be exclusive to Lincoln, a glass roof that electronically turns from clear to opaque and a spacious rear seat inspired by first-class airline travel and aimed at chauffeured Chinese customers. The right rear seat almost fully reclines and has an integrated laptop and writing desk that emerges from a chrome console that runs the length of the interior. The Continental also signals a new, more conventionally shaped grille design that Lincoln plans to adopt throughout its lineup in place of the split wing. The freshened 2016 GLE, the crossover now called the M class, will debut along with the high-performance Mercedes-AMG GLE63 4Matic and the GLE63 S 4Matic. The GLE goes on sale in August. Two years after the last redesign of the Outlander, a heavily reworked version of the three-row crossover will debut in New York. The 2016 Outlander, slated to arrive in U.S. dealerships in the second half of July, will sport a more aggressive grille and headlights, showing a new styling direction for Mitsubishi as the brand seeks a more unified and less conservative look. Mitsubishi is standing pat with its current engine offerings: a 2.4-liter four-cylinder gasoline engine mated to a continuously variable transmission and a 3.0-liter V-6 combined with a six-speed automatic. But the automaker says the 2016 Outlander will have a quieter, more refined ride thanks to its retuned chassis and powertrains. 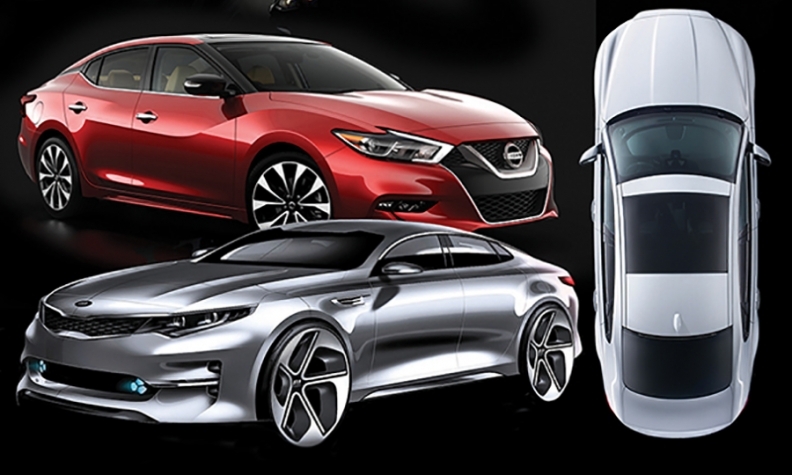 Nissan will unveil a major redesign of its Maxima sport sedan in New York. The automaker is indicating that the production version will look nearly identical to its recent auto show concept version, the Sport Sedan Concept. 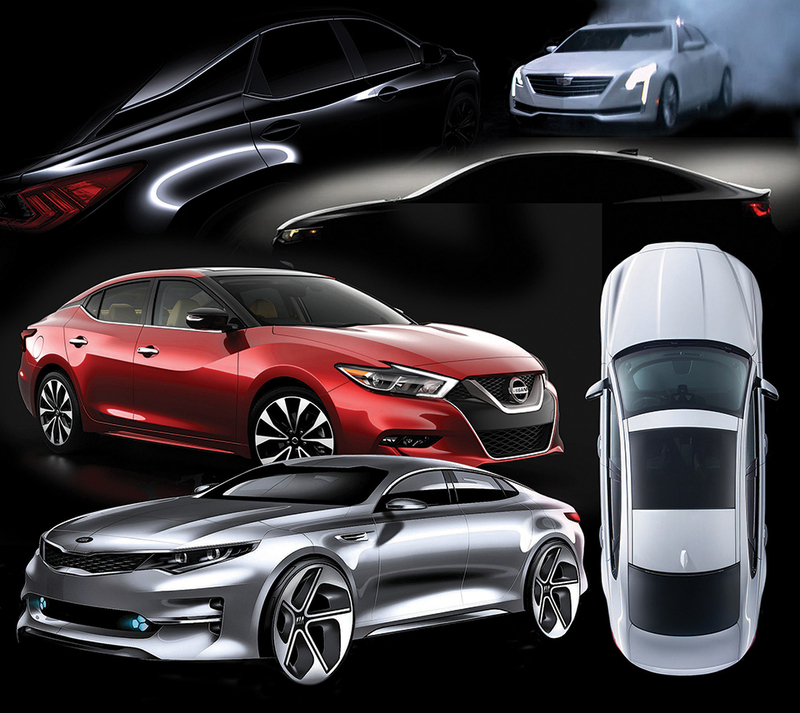 The eighth-generation Maxima uses more pronounced body creases to accentuate the flow of the metal side panels. Blacked-out body pillars give the illusion of a floating roof sitting above a fastback-styled rear window and snubbed tail end, while the front end and hood arch downward to an enlarged grille. The driver cockpit, instrument clusters and handling will help pull the Maxima back toward a sportier overall appearance, allowing Nissan to put more distance between the nameplate it once marketed as a “four-door sports car” and the bigger-selling Altima. Porsche will debut a variant of one of its sports cars, following a trend of special performance Porsches at auto shows this year. Porsche officials aren’t revealing details of the New York debut ahead of time. But could the vehicle be the anticipated Boxster Spyder? Volkswagen Group revealed this month that a new Boxster Spyder would be among 50 new or improved models being launched by the group this year. Toyota Motor Corp. will unveil two new Scion nameplates — a five-door iM hatchback and a sporty compact sedan designated the iA. They will be Scion’s first new vehicles in three years, and signal a renewed push by Toyota to revive a brand that has struggled to draw young buyers. The hatchback is the production version of the iM concept shown in November at the Los Angeles Auto Show. The iA will be Scion’s first sedan. Both are due in showrooms this year and are part of a significant overhaul of the Scion lineup, arriving as the iQ microcar and xD hatchback phase out. Toyota will show a RAV4 Hybrid. The vehicle will sport the bolder styling that also will be seen when Toyota freshens the gasoline-powered version of the compact crossover, expected next year. Neal E. Boudette, Nick Bunkley, Lindsay Chappell, Mike Colias, Diana T. Kurylko, Gabe Nelson and Amy Wilson contributed to this report.